The focus of this course will be on digital life drawing and painting using Adobe Photoshop and other digital techniques. The class also explores working with brushes and digital drawing tablets (such as those from Wacom) with a live model in the room to replicate through drawing and painting the human figure as would be done in a studio environment. Gesture, form, and anatomy will also be discussed in depth. Light is the element that will dramatically influence a set and the characters within. Depending on the use we make of it the perception of the image will change in order to fit the storytelling moment. 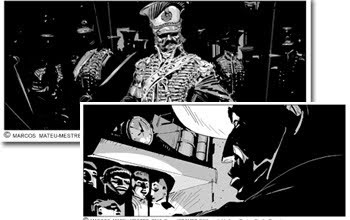 In this course we will observe and ink on paper sets under different lighting conditions, in convincing and practical ways, to then apply these techniques to specific panels that will deliver the desired message to an audience.There will also be slide show, analysis and discussion of artwork examples. The focus of this course is to investigate different methods of sketching and visual concept development for entertainment projects while stressing creative thinking, drawing from the imagination, and composition. Using fundamental drawing and design principles students will explore in class and at home using ink pens, pencils, markers/and or watercolors to fully realize their ideas through various exercises and small design projects including character design, environments, props and/or vehicles. 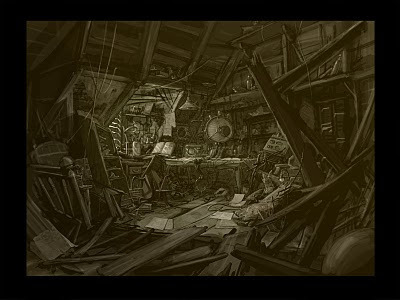 In addition to interactive lectures, instruction includes demos and technical information on materials, methods, and uses of various sketching techniques and styles as they apply to entertainment design. My goal is to give students a hands-on overview of entertainment design sketching and composition that is content rich in a very interactive and open setting that allows students to participate and express their creativity using the knowledge they gain from this course. Should Have Prior Knowledge Of: Basic perspective drawing, previous figure drawing/quick sketch. This course explores the fundamentals of environment design. The class will provide students with a comprehensive understanding of what goes into designing environments including a step by step process which will culminate with the students producing environment drawings of their own. Weekly lectures and demonstrations will cover topics such as staging and composition, 1, 2, 3 and 5 point perspective, scaling characters, visual story telling, natural and artificial lighting, thumbnails and rough sketching, final line and line quality and tonal drawings. Students will be expected to work within the classroom as well as manage homework assignments.